You know that place in one’s heart that normal people feel love? You feel pain. Red, throbbing pain mixed with anxiety because you still remember the last conversation you two had. It was short…formal…cold. And then he stepped out and the door closed with a heavy finality. You never saw it coming. When you were accepting the marriage proposal in your teens, you never thought that you’d be divorced in your twenties. But it’s not your fault that he chose her and you were left to pick up the pieces of your life at a time when most people have reached their plateau. You are worthy simply because you are you. This entry was posted in Heart, Inspiration, Life Lessons, Mind and tagged Dear Friend series, depression, Life. You think Kenji didn’t know what he was talking about. Not only can’t you do anything about this pain. You can’t even do anything with it. It’s like a heavy useless marble block just sitting there. Actually it’s not like marble. Because at least with marble, you can chip pieces off and turn it into a sculpture. But this pain you can’t translate into any form of art, because you can’t comprehend it yourself so you just carry it with you day in, day out, hoping that one day you will wake up and it will no longer be there. Maybe by then your threshold for pain would have shifted so you don’t feel it anymore, or maybe the pain would have in fact simply gone. Just disappeared. But does it really go away? Or does it remain in a more dormant form waiting for the smallest thing -word, gesture, breeze – to trigger it when you least expect it? We are all wounded. It’s part of being human. And yet the human spirit is resilient. It makes you go on even when you feel like giving up. It makes you dig your way out when you’ve been buried under crumbling stones of despair. 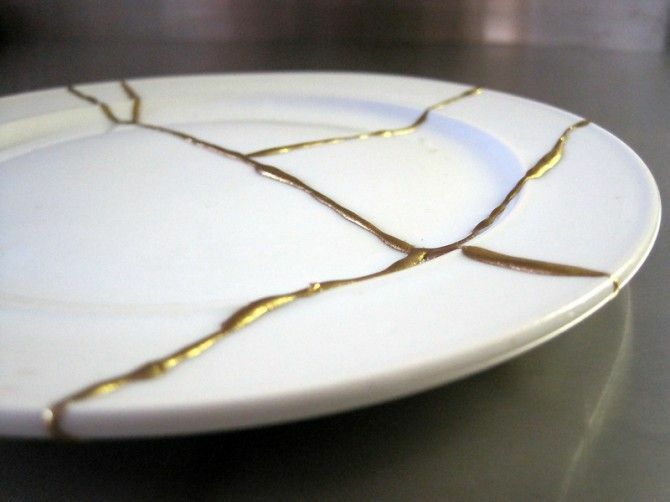 We are all wounded, but maybe we need to think of ourselves in terms of kintsugi, the Japanese art of repairing cracks with pieces of gold so that the broken is more beautiful than the new. And the pain…it might not fuel your journey, but it does serve a purpose. This entry was posted in Heart, Inspiration and tagged Dear Friend series, depression, insight, Inspiration, inspiring quote, Life, pain. The day started out well. I could tell by the smile playing on your lips. Even though it was small, the spark in your eyes showed that it was genuine. You’ve been busy, engaged with life enough to forget your pain. But then you met someone who said something, and whatever dam that has been keeping the sadness at bay broke and your feelings gushed back to overwhelm you. You need to remember that you are as strong as your weakest point. And your weakest point is that you want everybody to like you. But we live on planet Earth with human beings who have on average a hundred billion neurons in their brains. How these neurons connect with each other depends on a person’s individual experience in life, and that results in people having traits spanning the entire spectrum. So start from the position of knowing that not everybody will like you and not everybody will agree with you in everything and not everybody has your good interests at heart, but that’s okay. And because there will be different people in your life, some of them would be toxic and they would say things out of ignorance and insensitivity that would cause you immense sorrow. It’s easy to say that you will avoid them, but avoiding them is not always feasible because sometimes relationships are more complicated than they seem. So the easiest thing to do is put up boundaries. Define rules pertaining to every relationship; how vulnerable you’ll allow yourself to be around them, how much time you will spend with them, what areas of your life you will allow them to advice you about, and what areas are off-limit, what topics to discuss with them and what are your expectations of them. The thing is, no one – absolutely no one – has the right to take your happiness away, especially when you don’t have much of it to start with. So never give someone that kind of power. This entry was posted in Heart, Life Lessons, Mind and tagged character, depression, heart, Life, personality.